So enough with the ordering talk, let's get to the star. A quick primer on the Moto X that applies to all carrier flavors. 4.7" 1280 by 720 AMOLED screen. Ten megapixel camera and 2 megapixel front facing camera. I'll be going into more detail about the cameras in later posts, unsurprisingly. 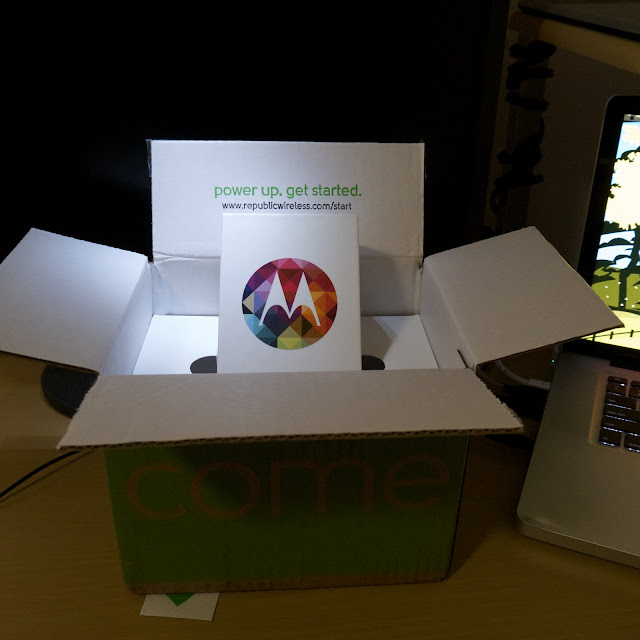 It's powered by a 1.7GHz Snapdragon dual processor, and an X-8 coprocessor designed by Motorola. Now some of you have stopped reading after that last bit because all you care about are GHz and processors and have judged the X to be last year's tech. What you're not taking into account is the X8 processor has four graphics cores for great, uh, graphics, and 2 low power cores to listen for a key phrase, and to check motion. This allows for things like the phone always listening for you to say, "OK Google Now..." and to know when it's being pulled out of a pocket or flipped over. I don't want to run down every feature of the X that countless other tech blogs have gone over, but I'll touch on my two favorites that aren't on any other phone, or aren't done nearly as well on other phones. First is Touchless controls. Once you train your phone to your voice you can say the phrase "OK Google Now" which will wake the phone up and then tell it a search phrase, or a task you want it to do. The act of voice controlled Google Now isn't new, but on all other phones you have to physically touch something to get it started. This is much better for driving (OK Google Now, where's the nearest In-N-Out? ), and a fun party trick. The other feature I really enjoy are Active Notifications. Because an AMOLED screen is able to turn on single pixels at a time the display is able to discreetly show you any missed calls, emails, texts, and other notifications without you having to wake the phone up. It'll also show you these notifications when it feels itself being taken out of a purse or pocket, or flipped over. It's really cool. This shot needs a choir just singing "ahhhhh"
So now on to the specific phone that is available from Republic Wireless. You get your choice of black or white and only 16GB of storage, which turns out to about 11GB of useable storage. Motorola makes 16 or 32GB sized phones, and offers Motomaker, a site where you can choose the color of the front and rear panels and the trim colors. It's pretty neat but I'm not that annoyed by the lack of color options. I would have preferred 32GB of storage, but there are ways around that either through the 50GB of Google Drive storage available to X owners (or other cloud based storage such as Dropbox or Box), or through devices like the Meenova microSD card reader. Neither is a replacement for built in storage, but it's nice to know you can access more. 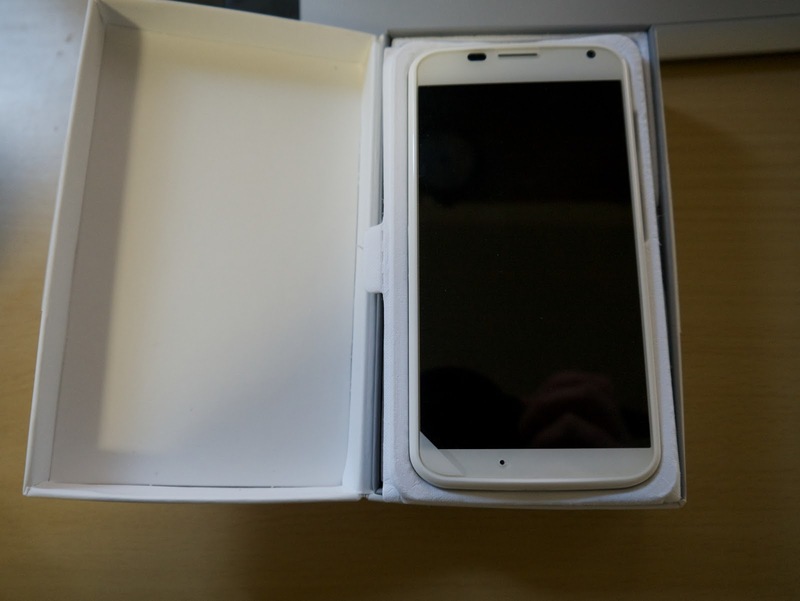 I ordered the white Moto X because in all my gadget owning life I've only had black gadgets. It was time to change things up. The plastic phone feels really good in the hand with a nice curved back that rests nicely in the palm and a little dimple that helps with holding the phone. At 4.7 inches the screen is just about as big as it can get for me to use with just one hand and allow my thumb to reach from edge to edge top to bottom. I'm not a fan of phablet phones, so I'm glad Motorola kept things reasonable. The screen also has really slim bevels on the sides making for a front that's almost all screen, except for the top and bottom parts that house the speaker and front facing camera and microphones. The physical buttons are on the right side; a power/wake button and a volume up/down rocker. A microUSB port is at the bottom for charging or data transport, and a headphone jack is at the top. Basically your everyday Android smartphone. Oh, did I mention it runs Android? I've not been the biggest fan of Android. It has, until recently, looked ugly and wasn't very intuitive to use, in my opinion. Coincidentally, or not, Android started to look and act better shortly after many of the engineers behind Palm/HP's webOS group went over to Google to work on Android. Basically I won't use a device using anything less than Jellybean (4.1 or so) because, quite honestly, life is too short to use ugly and hard to use user interfaces especially in a device you use every day. Thankfully the X runs 4.2.2 Jellybean, and will be skipping the minor Jellybean update of 4.3 and going straight to Google's latest KitKat.... sometime the early part of 2014 according to Republic Wireless. Next post, my initial hands-on impressions of the X.